How do we do no harm? Family doctor in a teaching practice at the Queen’s Family Health Team in Kingston, Ont, and Assistant Professor in the Department of Family Medicine at Queen’s University. Ms Jones is an 80-year-old woman with abdominal pain. An ultrasound showed a possible mass in her pancreas, likely a cyst, and the radiologist has recommended a computed tomography (CT) scan. You have ordered the CT scan but worry about radiation exposure. Beth is a 28-year-old basketball player who twisted her foot in a game 4 weeks ago. Findings of the initial x-ray scan were normal, but she still has a lot of pain and wants to get back on the court as soon as possible. You consider a repeat x-ray scan but worry about the radiation exposure. Jay is a 17-year-old who has had typical migraines for 4 to 5 years; the frequency and severity have been gradually increasing for the past 2 years, which concerns his parents. Although there are no worrisome symptoms or signs, you consider a head CT scan to make sure you do not miss anything ominous but worry about the radiation exposure. You know that radiation is harmful and have questions: What is radiation and how exactly is it harmful? How much harm is caused by x-ray scans, CT scans, medical isotopes, ultrasound scans, and magnetic resonance imaging (MRI)? What can help you make a decision about ordering a test? Many of your colleagues struggle with these same decisions. Let’s start with your first question. What is radiation and how exactly is it harmful? Radiation is the process by which radioactive elements emit subatomic particles and γ rays as they undergo nuclear decay. If living cells are within the trajectory of these particles or rays, they can damage the cells’ DNA, which can cause cancer as well as other diseases such as birth defects, inheritable disease, immune dysfunction, diabetes, and heart disease. X-rays are similar to the γ rays emitted by radioactive elements. Computed tomography scans consist of multiple x-ray scans that produce a 3-dimensional image. In fluoroscopy, many x-ray scans are done over seconds or minutes to observe the movement of body parts or fluids. Fluoroscopy is used for coronary angioplasty, hysterosalpingograms, cystourethrograms, endoscopic retrograde cholangiopancreatography, and barium studies. Because CT scans and fluoroscopy use many x-ray scans per procedure, they cause much more radiation exposure than single x-ray scans do. Medical isotopes emit subatomic particles or γ rays that are tracked to observe the pooling and movement of the isotope as it undergoes nuclear decay. This is used for bone, thyroid, and multigated acquisition scans. The isotopes typically have short half-lives of a few days, but until they are excreted from the body they can damage cells. Children are much more susceptible to the damaging effects of radiation because they have a larger proportion of dividing cells. Also, effects of radiation can take decades to manifest, and children have more years ahead of them to experience these deleterious effects. Risk is cumulative over a lifetime. Ultrasound and MRI tests do not use radiation. How much radiation do these procedures expose your patients to? It is estimated that about half of the population’s radiation exposure beyond background radiation is from medical procedures, mostly CT scans, the number of which has increased severalfold in recent years. Currently in Canada our regulations recommend a maximum of 1.0 mSv per year from all causes beyond background radiation and medical procedures.1 There is controversy as to whether lifetime doses under 100 mSv can cause cancer, but it is accepted by most radiologic organizations that all radiation is harmful, with risk increasing linearly with dose. From Brenner DJ, Hall EJ. Computed tomography—an increasing source of radiation exposure. N Engl J Med 2007;357(22):2277–84.2 Copyright © 2017, Massachusetts Medical Society. Reprinted with permission from the Massachusetts Medical Society. Table 1 lists the extent of radiation exposure from various tests.4,5 Keep in mind that the recommended maximum annual exposure is 1.0 mSv beyond background radiation and medical testing. How do I decide whether to order a test that exposes my patient to radiation? To make this decision you need to assess the risks and benefits of every test. I will not miss any important diagnoses. I will comply with the radiologist’s recommendations. I am less likely to get sued if I do a test than if I do not. I will be criticized for missing a diagnosis because I elected to not do a procedure, but I am unlikely to be criticized for doing a procedure that might cause cancer in a patient 30 years from now. There is a cost associated with the procedure. Patients can experience contrast allergy or claustrophobia. The patient will be exposed to radiation—this is especially important if the patient has had multiple exposures from previous tests. What could help you make your decisions? Could you obtain similar information by doing an ultrasound scan or MRI instead of a CT scan? Can you start to track your patients’ radiation doses in your electronic medial record? Does your local radiology department already track doses? Is your local CT scanner a newer one that reduces radiation exposure? The risk of cancer for Ms Jones from a CT scan is fairly low because of her age, so probably a CT scan is warranted, especially if she has never had one. 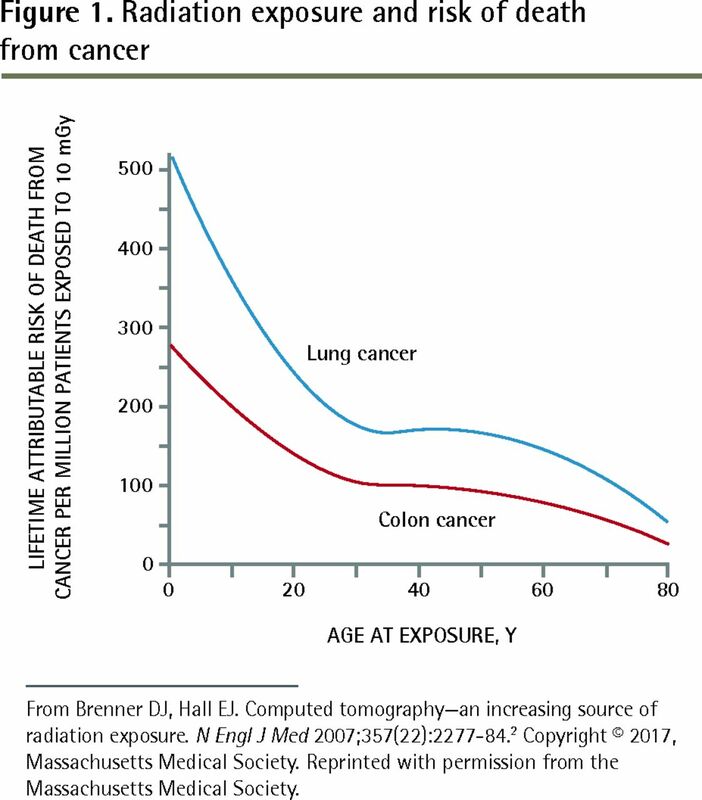 The risk of cancer due to an extremity x-ray scan is negligible, so repeating it for Beth increases her cancer risk minimally, even though she is fairly young. With no apparent red flags for brain tumour for Jay, further investigation is probably unnecessary. However, if you feel you should do something, consider MRI. I thank Drs Katie Webb and Nicola Gambarotta for their help preparing this manuscript.
. Radiation doses. Ottawa, ON: Government of Canada; 2017.
. Computed tomography—an increasing source of radiation exposure. N Engl J Med 2007;357(22):2277-84.
. Radiation-related risks of imaging studies. Waltham, MA: UpToDate; 2015.
. 2012 CAR diagnostic imaging referral guidelines. Ottawa, ON: Canadian Association of Radiologists; 2012.